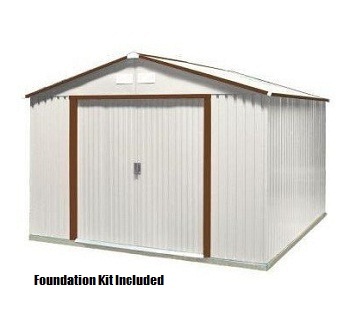 Free shipping for this 50534 metal utility building shed when shipped to the lower 48 states. Increase your storage space with this attractive metal shed. Foundation kit included. The Duramax sheds are heavy and high quality. A great way to store your tools, garden supplies, lawn mower or firewood. Competitive Edge Products, Inc. is an authorized distributor of Duramax 50534 storage garages.